Hong Kong, 2005 Cor – 93 min. After almost loosing his life during an attack on a witness he is escorting into court, Inspector Chan Kwok-chung (Yam) dedicates himself to bringing in the suspect Wang Po (Hung) whose criminal charges have just vanished. Knowing he is suffering from an eventually fatal disease, Chan feels time slipping through his fingers: he wants to educate little Hoi Yee (Lau Ching-lam), the murdered witness's daughter, and he wants to put Wang behind bars. Meanwhile retirement's day is closing in and his replacement Ma Kwan (Yen) is getting ready to assume command. Amidst an industry in crisis, SPL was celebrated as a quite successful title in the box-office that did not disappoint Hong Kong action cinema fans. 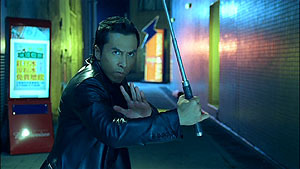 In fact, the martial arts choreography, developed by Donnie Yen Ji-dan, who is also the lead star, is the film's main appeal. That and the opportunity to see an older — we would rather say more mature — Sammo Hung Kam-bo still in shape and quite able to play a vicious villain. Sha Po Lang, directed and co-written by Yip Wai-shun, is a film that reflects the dynamics of the Hong Kong productions of the eighties and nineties. Yip seems to want to assert that by placing the plot in the period before 1997, the year of Hong Kong's retrocession back to China. The contrast between this film and more recent productions is clear: instead of using teenager pop stars, the director coordinates three martial arts experts that do not need stunts for the more lively scenes: Hung Kam-bo, Yen Ji-dan and Wu Jing. Both Donnie Yen and Jackie Wu (whose name is not credited in its Anglo format) are well-known Yuen Woo-ping's pupils. Yen played his first relevant roles, along with his first works as action director, in films such as Tiger Cage (1988) and In the Line of Duty IV (1989), both directed by Yuen. Yuen hired young Wu Jing to star in Tai Chi 2 (1996), a period film with an extensive use (or abuse, according to some) of wireworks. Ma (Yen Ji-dan) is the substitute of Kwan (Yam Tat-wah). The area is controlled by gangster Wang Po (Hung Kam-bo). Yuen Woo-ping's two pupils get the chance to shine on an explosive clash in one of the film's most striking scenes. Surprisingly enough, Yen and Wu improvised their fight during one single night (1). 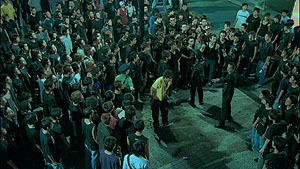 Physical confrontation resorting often to the use of blades is quite realistic and violent, and was the main cause for a Category III classification in Hong Kong. 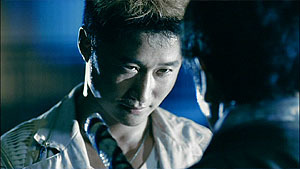 The confrontation between Yen and Hung, and the film's climax, was highly expected by Hong Kong action cinema fans. They are not exactly from two different generations, but Hung's larger experience and reputation would scare anyone in Yen's shoes. Yen however is known for being quite sure of himself (although those less diplomatic suggest that he is too self-centred). The two cops try to gather enough evidence to place Wang Po behind bars. 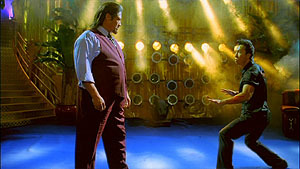 The choreography is not entirely “realistic”, but Yen held back, as it is the rule in a non-period film. Even though Hung's weight sometimes appears to be reduced by half, the character manages to be quite credible as a fearful and experienced fighter. On the other hand, we could do without Donnie Yen's lifting him up in the air with too much ease in a couple of occasions. Although the screenplay does not intend to be complex or smart and too concerned in surprising the viewer with unlikely twists — something quite in fashion lately —,Yip's direction brings it beyond the sheer action film (and it would not have been bad if it had stuck to be a good genre film). The supporting characters are well fleshed out, in spite of their small presence and dialogue, and the opposition between Chang and Wang Po also seems to work rather well, even without great narrative displays. We do not feel lack of development; we do feel we are watching excerpts of a broader and wider story. 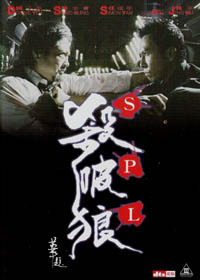 Yen and Wu Jing, playing an eminent killer with a blade, in one of SPL's most dynamic action scenes. 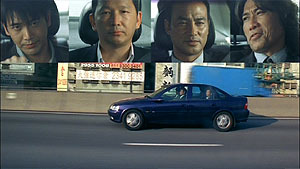 Sha Po Lang's three character title refers to stars in Chinese astrology, each one of them equivalent to the main characters in the film (Yen, Hung and Yam), but there is a symbolism more immediate to an international audience based on the relations between fathers and sons: the main action occurs at night during Father's Day. The date has meaning to both the police and the villain and the noir's drama (the tragedy and the violence) falls on the characters whenever they try to communicate or to re-establish ties long ago broken between fathers or sons. Chan wants to arrest or eliminate Wang Po as much as he wants the chance to raise the daughter of the man he was not able to protect. Amongst his men, one is trying to make peace with his father and the other wants to seize the rare opportunity to see his daughter who has been many years apart from him. Ma's men stand by his side, even when illegal methods are required. There are at times characters that do not fit because they are poorly defined, but in certain cases — such as this one — when the stories and the reasons behind the present situation are almost obliterated one gets much more realism; after all, it makes more sense to see someone just dealing with a problem than to have an artificial pause so that the character may speak a page of dialogue just to humour us with context. Yip Wai-chun manages thus a good balance between action and drama. We appreciate the development of a good story, whose main concerns are the obstacles risen between father and son, and the well choreographed action with some intense and brutal moments, quite rare in the more recent Hong Kong cinema. One should bear in mind that there is traditionally a real symbiosis between the director and the action director in the local industry; the action director, Yen, actually controls the cameras and blocks the shots according to what suits him best. When this process works, neither the actors' director spoils the action (with too many close-ups or allowing for a too fragmented editing to hide his inability), nor the action director gives any tips on how to shoot the more “sensitive” moments. The ending is typical of a good noir, even if until then there are situations that might appear to be bad choices. Notice that before the Hong Kong DVD there were copies circulating (either legal or not) with a version made for the Mainland China market. So if you read a review somewhere referring to a ridiculously happy and positive ending you should know they are talking of a somewhat different film. (1) See interview to the site Kaiju Shakedown. Although the cover and the poster are terrible, the Hong Kong DVD by Deltamac (R0) is rather efficient, with an apparent solid anamorphic transfer (we may only assume that the strong green and blue tones are intentional) with Dolby and dts sound tracks. The sound is quite dynamic and the use of the surround channels is efficient in the action context, either in the dialogue or when someone kicks an object that crosses the room before falling flat on the ground behind us on the left. Apart from a trailer in disc 1, this release includes the following extras on the second disc: Making of (10'02”), picture gallery (11'27” in video, with photos being enlarged until they vanish), press conference (22'58'', low resolution, home-movie style — as if they asked someone who happened to be there for the tape) and TV spots. In a moment of good-mood, Simon Yam wishes people to go and see Election (where he is the star) and rejoices at the fact that the audience is supporting Hong Kong cinema. On the other hand, Donnie Yen says he is very happy because Miramax has acquired the film's distribution rights. Does he not know that they are likely to cut off 10 minutes out of it, dub it in English and reedit the action sequences? Curiously enough, the director and Sammo Hung were not present. The extras display English subtitles, omitted in some moments where they are not particularly missed.